GOBOO. Community for book lovers. Community of people promoting book reading. Community of those who believe that the changes come through Culture. Community of those who want to spread the light around them. Community of those who believe that reading is very cool. Community which seeks to find new and well-read friends. 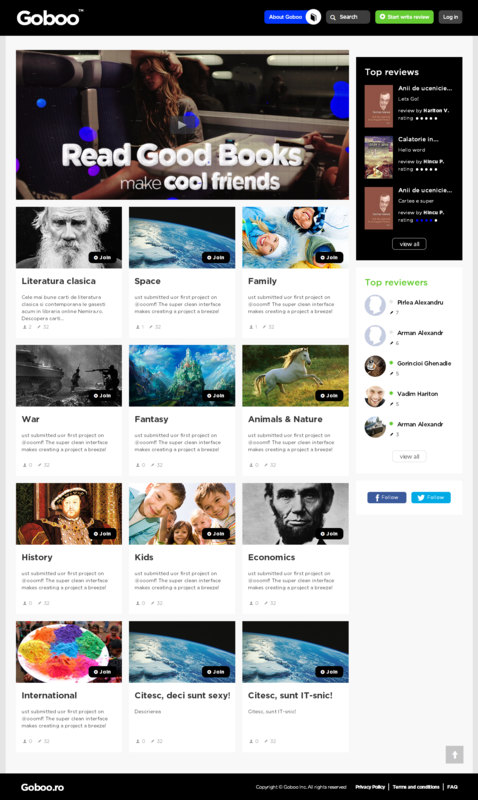 Community of those who want to earn money from their hobby – reading. What could be more noble than income from books ? "Consult Media Service" is a limited liability company founded by the investors from Republic of Moldova, the purpose of which is oriented towards the development and growth performance of products in the field of Information Technology (IT) developed for beneficiaries, thereby increasing the client's business performance .The company specializes in providing support, development and consultancy in the field of IT, providing a wide range of services in this area, such as: consulting, web development, design, support, outsourcing, process optimization solutions for both local and foreign clients.